Painter Mark Rothko is best known for imposing canvasses that eschew representation in favor of pure color and texture—using them to express fundamental human emotions. In THE SILENCE OF MARK ROTHKO, we visit Rothko's studio at 22 Bowery in New York, and go to Florence's Museo di san Marco, where the monastic work of Renaissance painter Fra Angelico deeply influenced Rothko's mission to create environments and not just paintings. In The Hague, filmmaker Marjoleine Boonstra introduces us to curator Franz Kaiser of the Gemeentemuseum, as his team installs the works for the first major Rothko exhibit to be held in Holland in 40 years. The film includes thoughtful, engaging commentary from experts including Rothko's biographer, Annie Cohen-Solal, and conservator Carol Mancusi-Ungaro (who speculates on whether splotches of paint on the studio floor may have been Rothko's). Fittingly though, for a film about a painter whose greatest works evoke both silence and emotion, THE SILENCE OF MARK ROTHKO lingers on paintings and locations - using architectural shots, interiors and streetscapes, to link Rothko's paintings to the world he inhabited. 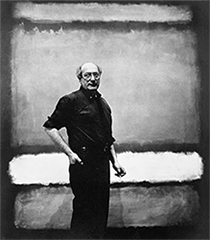 Featuring works from his early mythological period, his classic color field paintings, his later Black on Grey pieces, and the Rothko Chapel in Houston, the film is a unique artistic biography that provides a heightened level of intimacy and familiarity with its subject's work through carefully chosen visuals and interviews. Interspersed throughout are readings from the painter's writings by his son, Christopher —passages that illuminate and bring immediacy to Rothko's work and philosophy. The Next Big Thing: The contemporary art world is changing dramatically. How are collectors, museum directors, dealers and artists responding to transformations in the market? Sol LeWitt: Explores the artist's work and philosophy, using extensive interviews and documentation of artwork installed around the world.